Manzanita branch. 36" tall (minimum), natural red/brown color. These are perfect for large centerpieces or wish trees with crystals and flowers. Branch size is a minimum of 36", guaranteed. May be slightly larger depending on the harvest and time of year, and may require trimming. Our discounted shipping on this item is 43.76% lower than the standard FedEx rate! Need more than two pieces or a large quantity for your event? Order a case of 3 pieces. I bought the 26, 36 and 42 inch branches, I cannot express how beautiful and full theses branches are! 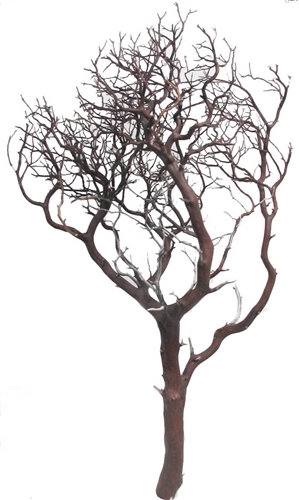 I’m making 15 centerpiece manzanita tress for my daughters wedding, I bought 11 -36 inch, 6-26 inch and 4-42 inch for less than 500.00$ Theses branches are huge! Excellent quality and very strong. 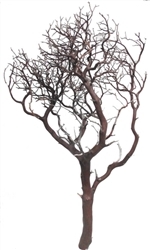 I would never buy fake branches when you can get the real ones for less. Delivered as expected. Beautiful even without the paint. Can't wait to see how they will look on our wedding day! Thank you! Beautiful branches, quick ship to the East Coast! Will be ordering more! Very pleased with the products I purchased, the very reasonable price, and the speed with which it was delivered.